Sean Kelly's Storage Auctions slot is naturally based on the cult TV series 'Storage Hunters' an American show whereby people gather outside abandoned lock-ups which contain a variety of left over items. Sean Kelly resembles a pub bouncer and is accompanied by his trusty bolt croppers and busts the padlock off. The door is opened and the bidders can see the nearest contents to them but can't enter or rummage through it. Based on just what's visible, they bid to Sean for the contents of the defaulter's lock-up. They may end up with tat and lose money, or pay their winning bid over and make a tidy profit as antiques or valuable goods are revealed when they enter and search it. 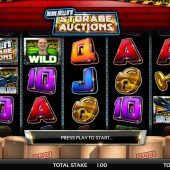 So, will this slot make you a profit? You have 20 pay lines and the usual 5x3 reels format. The symbols are all single and the game's logo is the top paying 5-of-a-kind with 25x stake, the same as for 5 of the Sean Kelly Wilds. Other symbols are keys and padlocks along with the card symbols for the lower wins. Sounds effects are limited to the sound of a rolling door type of noise on each spin. The Wilds can expand but only randomly not most of the times they appear. Why? 3 pairs of bolt croppers on reels 1, 3 and 5 trigger free spins. You are awarded 5 spins on a 5x5 grid but still get 20 paylines, although from R-L too as well as vertically on the reels due to stacked symbols. If you land 3 auctioneer's gavels (which you always seem to) you get a choice of either 2 extra spins, a reveal game where you choose a rolling door to reveal a cash amount or you can choose a simple auction. There is cash offered and you can reject the bid and get another offer. Reject that and you have to take the third amount offered.